This bird watching holiday was organised mainly using resources found on the internet. Although primarily a birding trip we also tried to find some time to visit local places of interest. Although we have both birded in South America before, we felt the use of local guides for some of our trip was invaluable to make the best use of the time available. Their local knowledge is of great use when negotiating trails in the cloud forest. Both guides arranged to either meet or return us to our next destination. International flights to Rio de Janeiro via Madrid were booked for £566 with E-bookers www.ebookers.com using Iberia and internal flight, £266 to Cataratus Iguaçu using Varig airlines. The weather was very warm and sunny along the coast at Marica. North of Marica the low lying mountains attracted some cloud which increased the humidity, nevertheless this was far from uncomfortable. Thankfully the threat of rain was minimal and we luckily avoided a tropical downpour. As we drove into Rio de Janeiro on the 30th a road-side thermometer recorded a temperature of 33 degrees C. This temperature was enough to burn one of us within 3 hours, a slight warning here. At Iguaçu the temperature was cooler. There was plenty of shade from the trees. On the 3rd April we had the only tropical down pour of this part of the trip. Thankfully this only lasted an hour, nevertheless it did rain on and off all day. At Serra Dos Tucanos we were further inland and conditions were humid at the lodge. With some of the nearby mountains 2000m or more cloud was ever present as was the threat of rain. On the 6th April we had a rain delayed start. The rain had ceased by 09.00 which permitted a mornings birding before returning at 12.15 which curtailed birding for the rest of the day. During our stay here further threat of rain was evident though no further time was lost. The habitats we visited during our 5 day stay at Marica were the coastal lagoons, marsh, restinga and the beach just south of the town. Most of these habitats could be reached with as little as 5 minutes drive from the birding lodge. To the north of the town there were open fields and lowland grasslands. There were three jungle trails to be explored, Boqueirao was the steepest climb rising to 600m, Espriado was rather easier rising to 300m to 400m, Serera de Tiririca like was a low hill-side and the climbing effort was minimal. 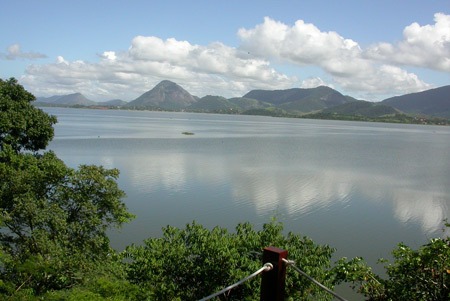 To the east of Marica there were large lagoons and salt pans at Praia seca. 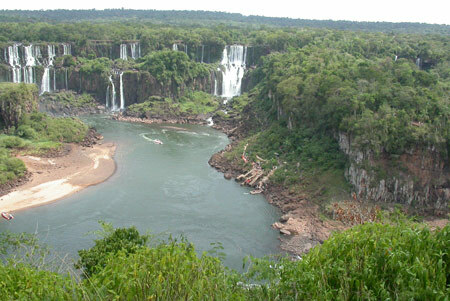 At Iguaçu Falls the hotel was surrounded by the forest overlooking the waterfalls. Our day trip to Paraguay was disappointing as we were taxied by open fields and towns over to Paraguay by a driver who had no understanding of our needs. The birding lodge at Serra dos Tucanos was in a wonderful setting with fantastic views of the cloud forest viewed from the terrace. Daily trips to cloud forest and steep mountain trails were arranged passing open fields. One high altitude trail affords some wonderful scenery. After an uneventful flight from Heathrow via Madrid, we were met at Rio de Janeiro International Airport by Richard Raby at 2000hrs who advised us to exchange some money to local currency as there were very few ATM machines available. Our Portuguese for understanding the few at Copacabana was none too good either! As it was already dark no birding was done and Richard took us straight to his lodge and after a drink we retired to bed. After a 0630hrs breakfast we were out in the field by 0700hrs, this was the pattern throughout our stay at Marica. After a short 5 minute drive, Richard took us to a coastal marsh; here there were small marshy pools, reed beds and larger lakes. This habitat was adjacent to the restinga coastal dune system. A good full-days birding was enjoyed without venturing too far, a perfect day after a day of travel. The weather was cloudy all day with the threat of rain which fell intermittently but lightly. By the end of the day we had clocked up 93 species. An early morning visit to the coastal marsh preceded a short drive east along the BR101 the main road to Rio. Eventually we turned north onto a track leading to a very steep mountain trail. We climbed 600m up Mount Boqueirao. I seemed to make heavy going of the steep damp trail. After starting the day with brilliant sun the clouds gathered threatening rain. However the cloudy conditions didnt amount to much and light rain only fell occasionally. Another 38 species were added to the list, including some wonderful Hummingbirds. At the end of the day Richard took us to a parrot roost, but although the noise was tremendous viewing conditions were difficult and we could only see a few birds flying in. Unfortunately I woke up clearly unwell. I think I have the flu. However we head off for the marsh again and I decide that I would rather take it easy so stay in one spot digiscoping whilst Paul and Richard go off in search of new birds. After a while we wander along the beach where I attempt a few shots of plovers in the heat running on the sand. Later we headed inland to climb the smaller dryer slope of Espiado. Luckily for me the climb is much more open and pleasant with a climb of 300 to 400m. The good early light remained with us throughout the day. In the evening Richard and Paul returned to the marsh but I take to my bed to nurse my now aching limbs, hoping that I may feel better in the morning. My flu has not abated and I have had a bad night of cold shivers. We set off visiting lowland fields before moving into the lowland forest at Serera de Tiririca. Luckily the trail is only a gentle one and I manage to keep pace. Moving east along the BR101 towards Praia seca, there were some huge inland pools and salt pans. Our reason for driving east was the Restinga habitat where we spent the remainder of the day. The weather had been very hot and sunny all day along the coast and in the lowlands. Our trip list is now on 161 species. Another bad night of tossing and turning meant that by 5.30am I had given up hope of sleep and had decided to get up and watch the dawn rise over the coastal lagoon from Richards wooden platform with wonderful views. After breakfast Richard had kindly agreed to take us to Rio and find us a hotel on Copacabana beach. His fluency in Portuguese helped us to negotiate a discount at the Hotel California for a 2 night stay to play tourist. Richard accompanied us up to the statue of Christ the Redeemer giving wonderful views across the city. Returning to the hotel we said our thanks and goodbyes with a final count of 166 species. We spent the afternoon on the beach and got burnt in the 32 degree heat! A lie in Yipee! So the extract in my diary reads. I know that my ill body desperately needed to rest so the lie in was greatly welcomed. Today we took a taxi to Sugar Loaf Mountain at an exorbitant price. Had we known that it was so close we could have walked it (if I had been fit!). The trip to the top involved 2 cable car rides, but once again the views were stunning. The afternoon was spent lazing on the beach, or in Pauls case swimming in the surf and getting badly burnt once again (will he ever learn?) The only birding involved was watching the numerous Magnificent Frigate birds wheeling around overhead as we soaked up the atmosphere on the beach. A 5am start for our flight to Iguaçu Falls. We are met at the airport and taken inside the Iguacu National Park to The Tropical Das Cataratas Hotel, the only hotel inside the park. This was an expensive option at over £100 a night for B and B but the only way we could be inside the park for birding at dawn to dusk. Most tourists are only allowed to be bused in after 9am and out again by late afternoon. The Great Dusky Swifts only seem to appear just before dusk to roost behind the Falls. The actual birding around the hotel was a little disappointing as we found finding any decent trails difficult. We spent the afternoon following the footpath by the side of the waterfalls along with all the other tourists. Because of the spray the humidity is extremely high and makes us weary. We saw only a few new species with our trip tally now on 171. After breakfast we decide to walk up the road towards the park entrance. We see our first reasonable views of Toucan here with their outrageous bills. After several hours the storm clouds gather and I head back to the hotel. Paul decides to brave it for a little longer which turns out to be a bad decision as a little later he returns like a drowned rat. Tropical downpours are very heavy! After lunch we had arranged for a taxi to take us to Paraguay. Although our driver spoke reasonable English he was none too keen to take us anywhere with reasonable habitat, he told us that it would be dangerous to walk amongst the locals because of the poverty. As it was only to be an afternoon trip we agreed to be taken over the bridge into Paraguay to a local shop designed for tourists. He warned us in advance, that we may have trouble returning because the local police are apt to close the border bridge without warning. Unfortunately for us he is proved right. Cuidad Del Este town was chaotic, with people everywhere. Poverty was an obvious problem and we became a target for all the street sellers, harassing us through the taxi window. We had no alternative but to keep the windows shut in the stifling heat. The collection of shops in the building we were taken to, were all selling electrical/high value camera goods, ostensibly duty free. We had been pre-warned that many could be fake. We had a nightmare of a return journey, as sure enough the police had closed the bridge and we had no option but to sit in an enormous queue for hours and wait for it to reopen. The ensuing scrabble to reach the bridge first, once it was reopened, was not an experience that I would want to repeat in a hurry. 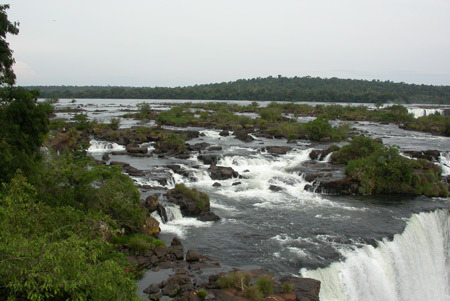 Once we were safely returned to our hotel, we walked down to the Falls to see the Great Dusky Swifts swirling around overhead, just prior to their roosting behind the Devils Throat Falls. 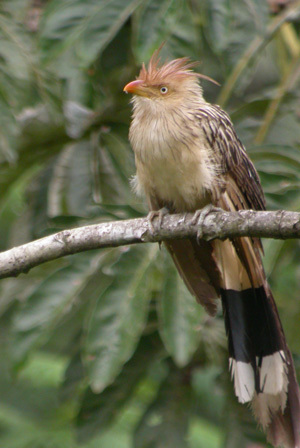 Our tally of birds seen in Paraguay amounted to 4 species! Bananaquit, House Wren, Eared Dove and House Sparrow! We woke up to the sound of a tropical downpour. It was also very chilly. After breakfast it was still raining but at least the ferocity of it had eased a little. I decided that we would need the assistance of an umbrella if we were to have any chance of keeping our optics dry. We ventured out following a cutting through the forest made for the electricity pylons. This proved quite productive and brought our tally to 183 species. A Surucua Trogon seemed to be amused as much by us, as we were of it, as it posed on the wires and trees. The rain continued even more heavily into the afternoon. I decided to call it a day and caught up with bird notes back in the hotel whilst Paul continued on getting very wet indeed! After birding in the early morning on another trail out of the back of the hotel, leading to the other vista of the bend in the river, we saw more toucans and trogons. By 1030hrs we were back on our way to the airport and flight, for our return to Rio. We are met in Rio by a member of staff from Serra dos Tucanos. We had seen an advert in Birding World for Serra dos Tucanos Birding Lodge and I had followed up the link to the website. Andy Fosters dad still lives in the UK (Tel 01243 641438) and he was very helpful providing information of a general nature as well as birding advice on Andys Lodge. The drive to the lodge took a couple of hours as it is inland a little. The Lodge is in a wonderful setting for watching birds either from sitting on the terrace or following the trails from the garden. 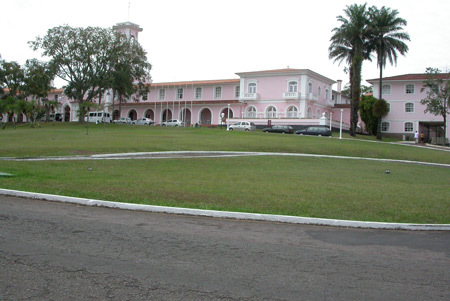 With its own swimming pool in the grounds it has a wonderful ambiance to it. It was truly tropical here, very hot and sticky. Once again I find myself wondering if it is the climate making me feel unwell. However I have been in tropical climates before and realise that I have still not shaken off a flu bug. After the evening meal I retire to bed hoping that I shall be fit enough to take part in tomorrows birding. Serra dos Tucanos offers superb accommodation and food. It is very isolated. 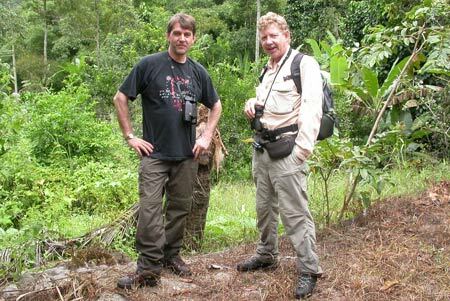 The owner Andy Foster is a young British birder who has set up the lodge to offer individuals and groups birding holidays. He has a variety of day trips on offer that can be purchased separately visiting a variety of habitats using his new minibus. 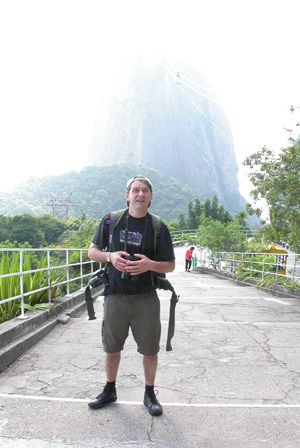 He is very enthusiastic and has had the experience of working and birding in Brazil for a few years. He speaks fluent Portuguese. Some days are fairly long but now and again only half days are on offer giving birders time to relax birding from the terrace, where, many birds can be viewed and photographed. There are short birding trails leading from the garden too, or a cooling swim can be taken in the garden pool. Today we joined an American birder, Bob, and a fellow birder from Norwich, Rachel, and went in search of the Three-toed Jacamar. Although the roads are good, as with all mountain terrain the twists and turns take time. Open views are afforded of grassy fields at Boca do Mato and we stopped at a couple of places to add to our lists. 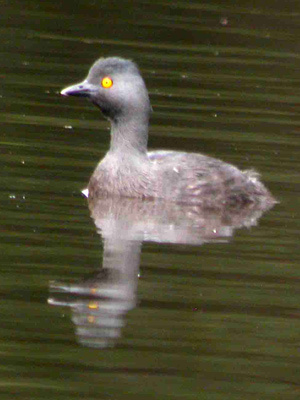 We stop in the Sumidouro for a Least Grebe swimming on a farm pond. Eventually we pulled of the main road onto a track and the hunt began for the Three-toed Jacamar. Andy had seen it on a regular basis but it took the five of us a little time to locate it. Good views were had but it only sat in poor light making photography too difficult. We returned to the lodge a bit late due to traffic jams in a local town, but the staff at the lodge had prepared a wonderful meal fitting for a wonderful days birding. We woke to a tropical downpour. We were due to bird a wetland but Andy said that it would be impassable and decided to take umbrellas to one of the near trails to the lodge. The rain was certainly very heavy as only the tropics knew how! We are determined not to let the rain spoil our enjoyment and are surprised by how many birds we saw given the conditions. Although wet, it was also warm and we felt over-dressed. The forest trail was very productive and gave us good views of many birds. As this was a half-day excursion, we returned to the lodge for lunch and Paul decided to sleep the afternoon away, whilst Bob, Rachel and I sheltered from the rain on the lodge terrace watching the birds coming into the feeder. After the evening meal, during the log call in the lounge, I spotted a large black cat running along the terrace outside. Andy ran for a mammal field guide and I realise that I have just seen a Jaguarindi. It was no doubt what the guard dogs had been barking at moments earlier. However the birding to get to the trail was good. I saw one of the birds that I have missed in South America on previous visits; a Limpkin. I was quite thrilled with the sighting. 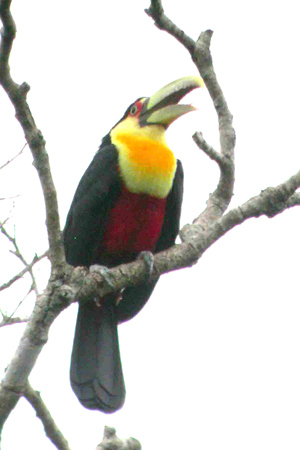 A Channel-billed Toucan was also spotted. For me this was the best birding of the day, as I prefer more open vistas to narrow steep enclosed dark forest trails. Once we had arrived at the start of the trail, the path was steep and narrow. It is the kind of birding that I hate as very few birds were seen as we ascended. It seemed a lot of effort for very little gain. We were hoping to see a few contingas but this was not to be. Storm clouds had gathered and Rachel was a little concerned to be caught at the top of an exposed mountain. I too was keen to descend as there seemed very little in the way of bird activity. This is the first day that I had woken up feeling well. At last my flu bug has abated. The weather had also brightened and it was a lovely sunny day. Andy took us to the Tres Picos Mountains. The scenery was good and I was looking forward to the high altitude trail which was much more open than the other trails. We walked at a leisurely pace and had plenty of bird activity to keep us amused. 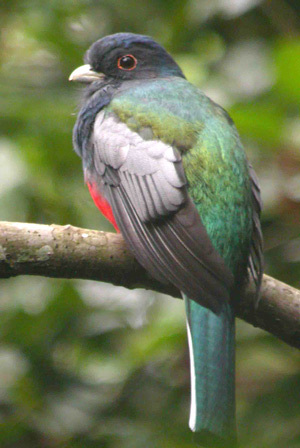 We see Blackand-gold Cotinga as well as Swallow-tailed Cotinga. Towards the end of the day I was trailing behind the others and spotted a raptor sat some distance at the top of a dead tree. We had long stopped looking at every Black Vulture but this one just looked odd. The others were some way in front, but I felt it was necessary to examine this raptor through a scope. I called the others back to look. Excitement grew but we were unsure of the identification. I managed to take a picture through Bobs scope by hand holding my camera to it. Once back at the lodge we were still unsure as to the raptors identification. 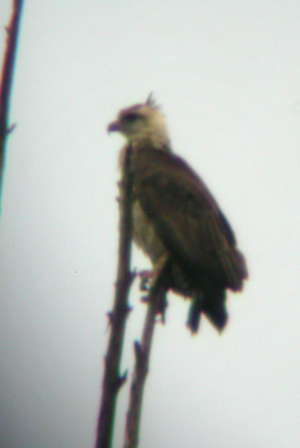 It was eventually identified as a juvenile Crowned Solitary Eagle an unusual record for the area. Our species tally by the end of the day had crept up to 275. We were up early for a few hours birding from the terrace before one of the staff at Serra dos Tucanos took us back to the airport. We said our goodbyes. My species list ends on 278 but as always Paul claimed a few more! It has been an enjoyable experience but just a shame that I spent most of it with a flu bug! 10+ on the coastal lagoons south of Marica on the 26th with a single on the 29th. 20+ on the 26th and 10+ on the 28th, observed from the beach south of Marica. Numerous and common where ever water was present. Always present by the coast, there were 300 together over the Copacabana Beach on the 30th. 4 present in the coastal lagoons south of Marica on the 26th and 3 on the 29th. 20+ on the coastal lagoons south of Marica on the 26th and 1 or 2 the following day. 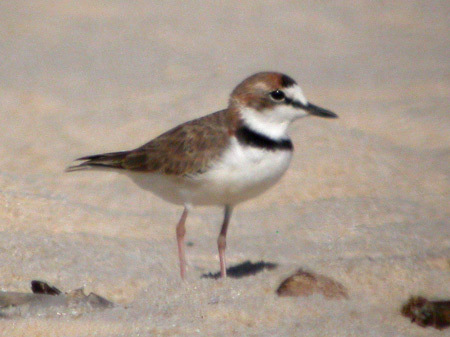 Numerous and common in the coastal lagoons south of Marica. Observed in small numbers in the coastal lagoons south of Marica, a maximum of 3+ on the 26th. from a moving car the following day. from the birding lodge decking on the 30th. Observed in small numbers in the coastal lagoons south of Marica. A single bird was flushed from reeds on the coastal lagoons south of Marica on the 26th. evening of the 28th another bird was observed on the marsh just south of the birding lodge. present on the salt pans at Praia seca on the 29th. 50+ present on the coastal lagoons south of Marica on the 26th. 200+ on the coastal lagoons south of Marica on the 26th. Numerous and common every where. 3 around the coastal lagoons south of Marica on the 26th with 1+ on the 28th. An excellent view of 2 perched in the restinga at Praia seca on the 29th. Singles observed in the lowland fields north of Marica on the 28th and 29th. lowland fields to the north. 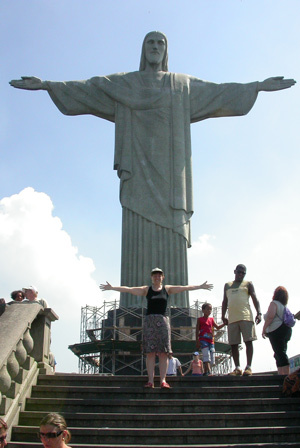 A single bird soared past Christ the Redeemer in Rio de Jeneiro on the 30th. 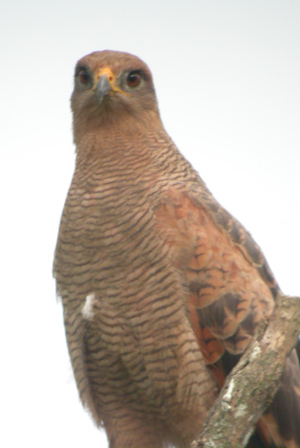 3 were hawking over lowland fields near the lagoons south of Marica on the 26th. 28th. Excellent scope views were enjoyed in the early morning light. 30th. Also heard on the 26th. 10+ were present in the coastal lagoons south of Marica on the 26th with 3 on the 28th. A single bird was present on the coastal lagoons south of Marica on the 26th. 10+ afforded excellent views on the beach just south of the birding lodge on the 28th. north. Present near damp pasture or where water is present. Good numbers present around the coastal lagoons south of Marica, maximum 30+ on the 26th. on the 27th,28th and 29th. 6+ in the dunes on the leeward side of the beach just south of the birding lodge on the 26th. 10+ in the dunes on the leeward side of the beach just south of the birding lodge on the 26th. Present in small numbers around the coastal lagoons south of Marica, maximum 6+ on the 29th. 16 on a coastal lagoon east of Marica near Praia seca on the 29th. Rio de Janeiro across the bridge. 4 were present amongst Royal Tern on a coastal lagoon east of Marica near Praia seca on the 29th. 200+ present on the coastal lagoons south of Marica on the 26th. 20+ on Serera de Tiririca on the 29th . Usually observed singular in the restinga south of Marica. A single bird observed very well sat low in a bush in the restinga just south of the birding lodge on the 27th. Marica on the 27th and a singular sighting on the 29th. the roost site only heard. Despite this at least 50 flew in on the 26th. 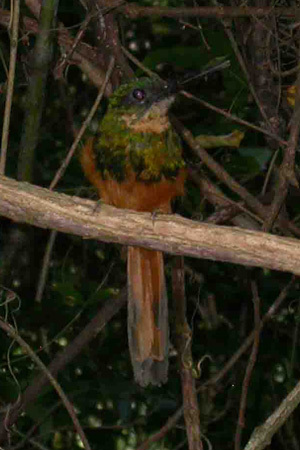 A single bird in the lowland hills at Serera de Tiririca to the north of Marica on the 28th.. Numerous and common in the lowlands, usually sat out in the open. 50+ on the 26th, usually in small groups of 6 or 7. A single singing bird observed very well in the restinga on the 26th. Common in the lowlands usually sat on fence posts, singular or two together. A single bird located at a traditional day roost site in someones garden on the 26th. 100+ over the lowlands on the 29th. Small numbers observed most days. 4+ along the mountain jungle trail of Boqueirao on the 27th. A single bird coming to a flowering tree along the mountain jungle trail of Boqueirao on the 27th. A single bird near the coastal marsh just south of the birding lodge on the 27th. A single bird on the mountain jungle trail of Boqueirao on the 27th. Serera de Tiririca on the 29th. 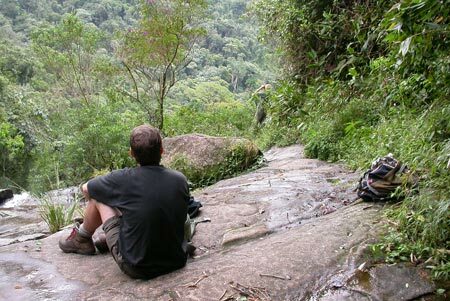 2+ along the jungle trail of Serera de Tiririca on the 29th. 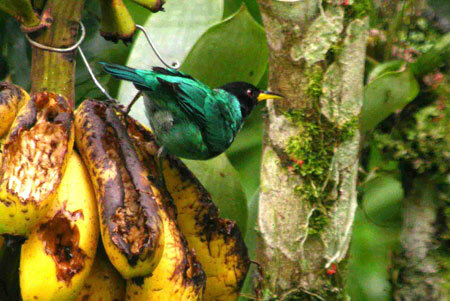 Single birds in the lowland jungle trails of Espriado and Serera de Tiririca on the 28th and 29th. 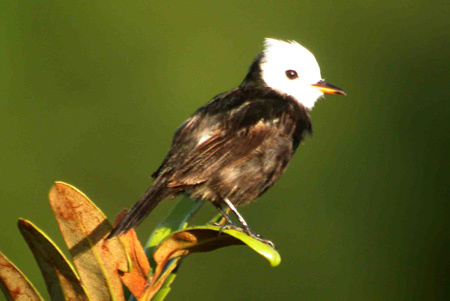 Single birds along the lowland jungle trails of Espriado and Serera de Tiririca on the 28th and 29th. Regular sightings on the coastal lagoons. A single bird on the coastal lagoons on the 26th. Small numbers observed on the coastal lagoons 26th-28th. 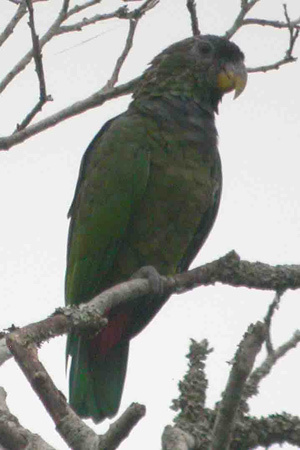 2 birds were observed along the lowland jungle trail of Espriado on the 28th. 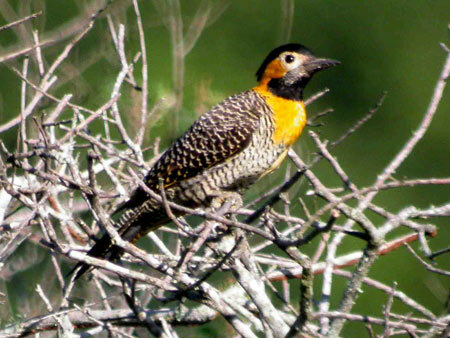 2 birds were observed in the lowland country and a probable nest site located on the 28th. Usually observed in small numbers most days. 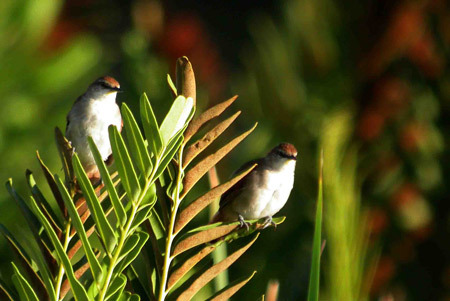 Single birds along the jungle trails on the 27th, 28th and 29th. 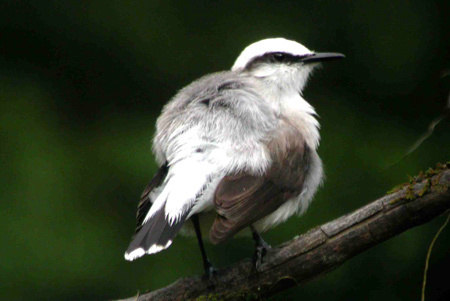 Single birds observed most days in the lowland open country. Small numbers observed in the coastal Restinga and beside the lagoons on the 26th, 28th and 29th. 3+ on the 26th and 1+ on the 28th observed in the coastal Restinga and beside the lagoons. Common on the marsh just south of the birding lodge. the jungle trail on Serera de Tiririca on the 29th. jungle trail of Boqueirao on the 27th. 2 birds observed along the mountain jungle trail on Boqueirao on the 27th. A single bird observed along the mountain jungle trail on Boqueirao on the 27th. Usually 2 or 3 observed along the jungle trails. 1 or 2 observed along the jungle trails on the 27th, 28th and 29th. A pair responded to a tape in the Restinga beside the salt pans at Praia seca on the 29th. 2 birds observed along jungle trail on Serera de Tiririca on the 29th. 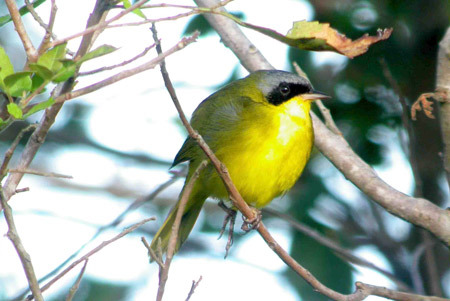 Single birds were observed along the jungle trails on the 27th, 28th and 29th. jungle trail on Serera de Tiririca on the 29th. 2 in the coastal Restinga on the 26th and a single bird the following day. 2 in the coastal Restinga on the 26th. In the coastal Restinga 2 were present on the 26th with singles on the 28th and 29th. A single bird present in the coastal Restinga on the 27th. A single bird observed along the jungle trail on Espriado on the 28th. A single bird observed along the lowland jungle trail on Serera de Tiririca on the 29th. Observed in the coastal Restinga with 2 on the 26th and singles on the 27th and 28th. Singles observed in the coastal Restinga on the 26th and 28th. A single bird observed perched on a TV aerial in Rio de Janeiro from Christ the Redeemer on the 30th. A single bird observed in the coastal Restinga on the 26th. south of the birding lodge. At least one pair present daily on the coastal marsh just south of the birding lodge. Observed daily in the coastal lowlands and Restinga. Observed in the coastal Restinga with 2 on the 26th and a single bird on the 27th. A group of at least 4 birds were observed in the lowland fields north of Marica on the 28th. Common and very vocal observed frequently daily. A single bird observed in the lowland fields north of Marica on the 28th. along the lowland jungle trail on Serera de Tiririca on the 29th. treetops. 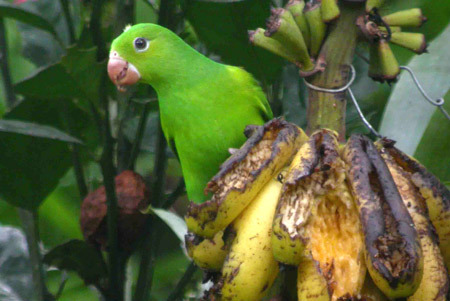 A single bird was observed along the lowland jungle trail on Serera de Tiririca on the 29th. Single birds observed along the jungle trails on the 27th and 28th with 2 on the 29th. Single birds observed on the 27th and 28th. A female bird observed along the lowland jungle trail on Serera de Tiririca on the 29th. A single bird observed along the mountain trail on Boqueirao on the 27th. Common, observed most days over the coastal lagoons. Common, observed in good numbers over the coastal lagoons and lowlands daily. Small numbers observed over the coastal lagoons on the 27th,28th and 29th. An excellent individual was observed well right on the top of Boqueirao on the 27th. A single bird observed along the lowland jungle trail on Espriado on the 28th. Observed in small numbers daily. Observed in small numbers at the birding lodge and in the lowlands on the 26th,27th and 29th. day on the lowland jungle trail Espriado. 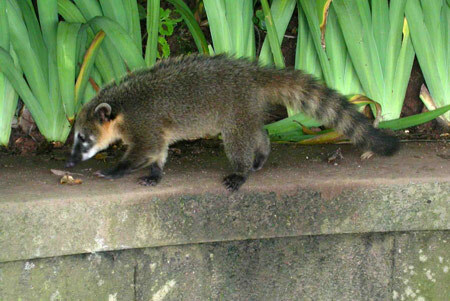 Frequently seen around the front of the hotel grounds at Iguacu Falls. Common where ever there was plentiful housing. 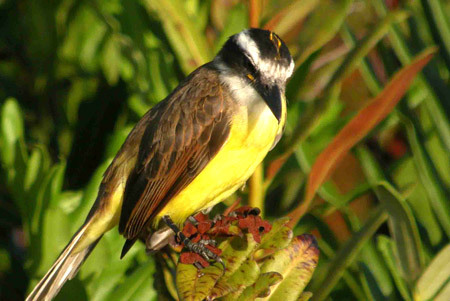 Common in the lowlands and beside the coastal lagoons in the Restinga. 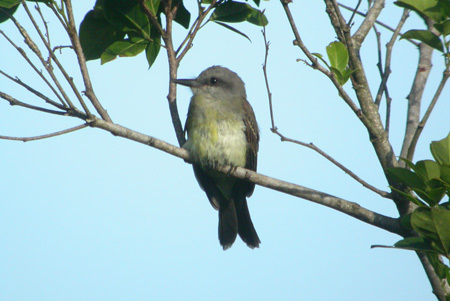 Single birds along the jungle trails on the 27th and 28th with 2 on the following day. A single bird beside the coastal lagoons on the 26th. Usually 2 or 3 observed daily along the jungle trails. Several birds observed daily on the marsh just south of the birding lodge. There were 2 birds observed along the mountain jungle trail on Boqueirao on the 27th and 2 along the lowland jungle trail on Serera de Tiririca on the 29th. Common observed daily in small numbers. Regular on the bird feeders at the birding lodge. bird along the lowland jungle trail on Serera de Tiririca on the 29th. 2 were present in the Restinga at Praia seca on the 29th. At least 4 birds were observed along the low land jungle trail on Espriado on the 28th. Common, regular observations daily. Also coming to the feeder in the garden of the birding lodge. Observed in the Restinga with 2 on the 26th and 27th. was observed along the lowland jungle trailon Serera de Tiririca on the 29th. Observed along the mountain jungle on Boqueirao with 2 present on the 27th. Usually observed on the bird feeder at the birding lodge most days. Reasonably common, observed regularly daily. Observed in the lowlands with 2 on the 29th. Observed near the coastal lagoons with 2 on the 26th. Common, over 100 observed on the 26th with good numbers on subsequent days. Observed near the coastal lagoons with 10 on the 26th and a single bird in the lowlands on the 29th. Observed in the lowlands with 3 on the 29th. Observed near the coastal lagoons with 10 on the 26th. Regular birds coming to the bird feeder daily at the birding lodge. A single bird on the marsh just south of the birding lodge on the 28th. Observed near the coastal lagoons with 3 on the 28th.